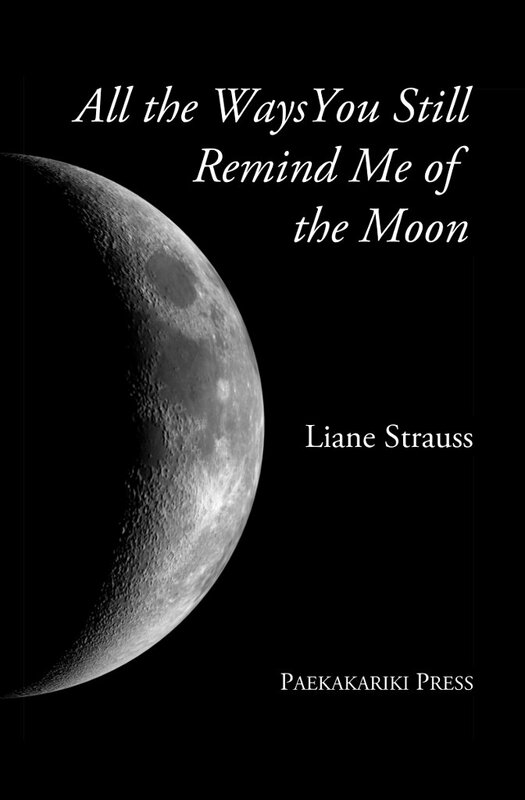 Liane Strauss' All the Ways You Still Remind Me of the Moon is a sequence of poems exploring the mythic nature of the moon. The book is bound in black, with a slate-shaded illustration of the sickle moon on the cover. The poems are divided into sections which illustrate its phases. These sections are prefaced with a silver-on-black image of the moon in the appropriate state of fullness or dwindling starvation. The New Moon is the one, striking, exception. It's printed black on black, so that the shape of the satellite is only visible when the book is tilted away from the reader. The poems are clean, carefully structured — the lines are sound and occasionally lovely — but they don't risk much. They don't ask much, if anything, from the reader. These are very safe poems. I don't even stop to wonder what it is. In theory, a villanelle about the moon (in this case, the clumsily-titled 'Villanelle of the Moon’) is an excellent idea. The moon shows its face to us in cycles, seeming to change but remaining ever-constant. A villanelle is a cyclical form whose lines seem to remain the same through their repetitions, but which flux and change their meanings depending on the shifts in their context. In practice, this villanelle seems arbitrary and forced. There is no thematic thread, beyond the naked, unexplored face of the moon, tying the poem together. It seems like the poet wanted simply to write a villanelle, but never considered that formal structures are an aspect of language. They are meant to provide the skeleton of the poem, defining its shape and nature. Formal poems are not sudoku: one shouldn't plug words into the frame and call it good. They are a living structure. because it's always leading me to you. The line 'promises to slip on without pain’ is very good, but in the context of the poem the stanza in which it appears seems to serve no purpose — save filling enough space to complete the requirements of the form. I have noticed that, when poets begin experimenting with form, they often treat them like puzzles. They learn the structure, like an infant learning words by mimicking the base sounds of their mother’s tongue, before they grasp the meanings or the grammar. That's a fine and natural thing to do; that's how we learn. But a person two years into their German lessons should probably not try to be an orator in that tongue, and practice poems should not appear in published books. And you will be destroyed by what I’ve done. This book is clean, and easy to read. It's beautifully-printed. There is no threat, or hard edge in it. It will, undoubtedly, appeal to a certain kind of audience. It will be read, and enjoyed.